La Palma Villa C12 - Mossel Bay Area Accommodation. This apartment is located in Diaz Strand on the Garden and Whale Route area in a security complex. There is an elevator in the apartment block as well as full access control and security around the property. It is halfway between Cape Town and Port Elizabeth, and 2 kms from both Mossel Bay and Hartenbos. This apartment is on the second floor and consists of two bedrooms, with one double bed and second bedroom with one double bed and one single bed for 5 people. The bathroom offers a bath with a shower overhead. There's a fully equipped kitchen with washing machine, tumble dryer, microwave oven, stove with oven and fridge. From the living area, main bedroom and balcony there are limited sea view's. 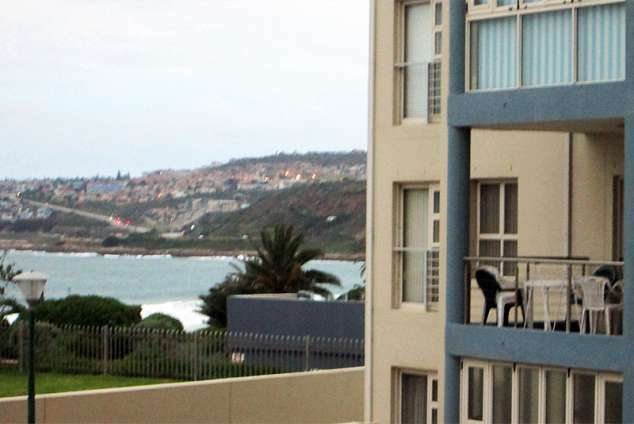 You can listen to the waves breaking in front of Diaz Beach Hotel while you braai in the built-in barbecue on the balcony. Within 50/100 metres of the apartment is the Beach, Waterworld (Waterwurm) and Heated Swimming pool and a Convenience Shop. The Langeberg Shopping Mall being 1.5 kilometre away. There is safe covered reserved parking for one vehicle. Please Note: Card-electricity is in use for own account. 43775 page views since 19 Mar, 2007.